Stakeholder media is an emerging sector, largely overlooked by media theorists, which has the potential to have a tremendous impact either through online networks or by providing content to news media. It can be defined as (usually online) media that is controlled by organzational or institutional stakeholders, and which is used to advance certain interests and communities. NGOs typically create such media; so do consumer groups, professional associations, labour unions, etc. The key limit on its ability to influence public opinion or other stakeholders is often that it lacks capacity to undertake discovery of important information, even more so than the downsized news media. Kaas og Mulvad, a for-profit Danish corporation, is one of the first investigative media enterprises that provides expert capacity to these stakeholder outlets. The firm originated in 2007 as a spinoff of the non-profit Danish Institute for Computer-Assisted Reporting (Dicar), which sold investigative reports to media and trained journalists in data analysis. Its founders, Tommy Kaas and Nils Mulvad, were previously reporters in the news industry. Their new firm offers what they call “data plus journalistic insight” (content which remains semi-finished, requiring further editing or rewriting) mainly to stakeholder media, which finalise the content into news releases or stories and distribute it through both news media and their own outlets (such as websites). Direct clients include government institutions, PR firms, labour unions and NGOs such as EU Transparency and the World Wildlife Fund. The NGO work includes monitoring farm and fishery subsidies, and regular updates on EU lobbyist activities generated through “scraping” of pertinent websites. Indirect clients include foundations that fund NGO projects. The firm also works with the news industry; a tabloid newspaper purchased their celebrity monitoring service, for example. 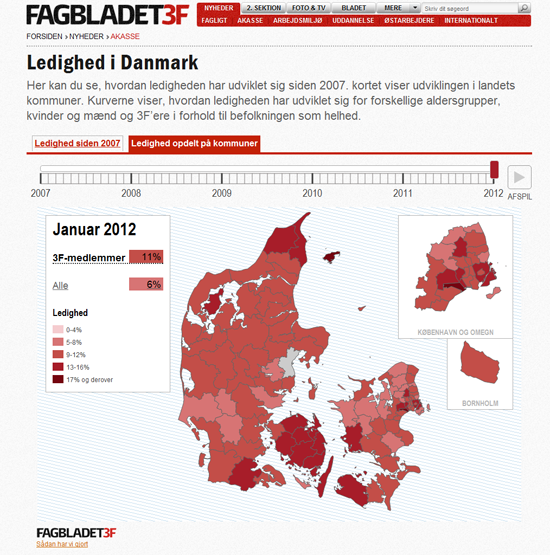 A data visualization with key figures about unemployment in Denmark undertaken for 3F, which is the union for unskilled labour in Denmark. Another project for 3F shows how different living conditions are in different parts of Denmark. The map shows 24 different indicators for living conditions. A project that calculates a “debt index” — and visualizes the differences in private economy. A project which maps and analyzes the proximity of dangerous facilities to kindergartens and other day care institutions, undertaken for “Børn&Unge”, a magazine published by BUPL, the Danish Union of Early Childhood and Youth Educators. Data visualization on five areas of CR-data for the Danish wind turbine company, Vestas, with auto-generated text. Automatically updated on a quarterly basis with 400 webpages from world scale data down to the single production unit. Type in your last name and look at the distribution of this name around different geographical areas in Denmark. Every day we extract all the bad food inspections and map all the latest on a map for the Danish tabloid Ekstra Bladet (see half way down the website for the map). Kass og Mulvad are not the first journalists to work with stakeholder media. Greenpeace, for example, routinely engages journalists as collaborators for its reports. But we know of no other firm whose offerings to stakeholder media are data-driven; it is much more typical for journalists to work with NGOs as reporters, editors or writers. The current focus in computer-assisted news media is on search and discovery (think of Wikileaks); here again Kaas og Mulvad innovate, by focusing on data analysis. Their approach requires not only programming skills, but also understanding of what kind of information can make a story with impact. It can safely be said that anyone wishing to imitate their service would probably have to acquire those two skill sets through partnership, because individuals rarely possess both. The firm undertakes about 100 projects per year, ranging in duration from a few hours to a few months. It also continuously invests in projects that expand its capacity and offerings. The celebrity monitoring service was one such experiment. Another involved scraping the Internet for news of home foreclosures and creating maps of the events. The partners say that their first criteria for projects is whether they enjoy the work and learn from it; markets are sought after a new service is defined. They make it clear that in the news industry, they found it difficult to develop new methods and new business. We have no editors or bosses to decide which projects we can do, which software or hardware we can buy. We can buy the tools according to project needs — like the best solutions for text scraping and mining. Our goal is to be cutting edge in these areas. We try to get customers who are willing to pay, or if the project is fun we do it for a lower charge. Turnover in 2009 was approximately 2.5 million Danish kroner, or €336,000. The firm also sustains the partners' reputations as cutting edge journalists, which maintains demand for their teaching and speaking services. Their public appearances, in turn, support the firm’s brand. The news industry’s crisis of declining capacity is also a crisis of under- utilisation of capacity. Kaas and Mulvad had to leave the news industry to do work they valued, and that pays. Nothing prevented a news organzation from capturing that value. In at least some markets, there exists a profitable market for “semi-finished” content that can serve the interests of stakeholder groups. However, this opportunity raises the issue of how much control journalists can exercise over the presentation and use of their work by third parties. We recall that this issue already exists within the news industry (where editors can impose changes on a journalist’s product), and it has existed within other media industries (such as the film industry, where conflicts between directors and studios over “final cuts” are hardly rare). It is not a particular moral hazard of stakeholder media, but it will not disappear, either. More attention is needed to the ethics of this growing reality and market. From a revenue standpoint, a single product or service is not enough. Successful watchdog enterprises would do better to take a portfolio approach, in which consulting, teaching, speaking and other services bring in extra revenue, support the watchdog brand.